There is only 1 book out of 10 which makes you drool over it for a very long time. At times the everything from the start till the end is just like alcohol which makes people loose their senses and dance their way around in ignorance. Author Terin Miller in his novel "Kashi" has tried his hand on making readers drool over a story churned out of the heart of religion and emotions. So is it a picture perfect novel? Let's find out. 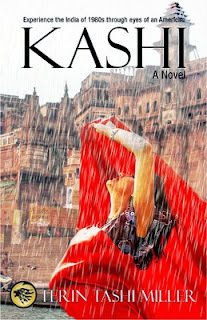 Kashi is a tale of clashes of cultures, relationship experiments and religious and moral differences in the holiest of Hindu cities, just at the time India's second generation of independence comes to adulthood in the form of Sumita Meetha Sharma. Meetha Sharma, educated, attractive, worldly, the daughter of a wealthy import-export businessman in the nascent new Indian middle - class, desires to be like her American and other expatriate friends. She chafes at old world ideas of behavior and conformity and longs to be seen as an equal in society. But her desires have consequences she doesn't fully realize, especially for the traditional Hindu musician to whom she was promised when she was 13. A story of a generation of Indians unlike any that has come before them born in a free and independent country, a country only granted its freedom after much effort and sacrifice by their forebears, a country only granted the opportunity to rise in the world as its former colonial status fades into history. First look at the cover and the title and it'll leave the readers spell bound. The backdrop and the effect along with the woman in red makes it a mesmerizing experience for the readers. The blurb talks about older India and a woman and various other aspects of India at that time. It's a good blurb but there's a lot more to it than meets the eye. The story is narrated by an American John Colson who arrives in Varanasi and is working for the Wire Service. He writes and files articles depicting the culture, values and other things of importance of India. Along this journey he makes some friends in form of Chet Bardus, Rajan, Liz Aven & Meetha Sharma. He is attracted towards Meetha in his first meeting but he is unable to express it. The story moves from the religious city to the pompous of Delhi and then to the picturesque setup of Darjeeling from where there is a lot on stake for Meetha, Liz, Chet & John. It all gets messed up and in the end it leads from incident to another. So will John be able to confess his love to Meetha? What will happen to Liz & Chet? What role Rajan has to play in the story? What will happen at the end of it? That's what the story is all about. The uniqueness of the story can be gauged from the fact that it spans over 3 different cities and mesmerizes all throughout. The set up and the characterization and the narration all suits the taste of the readers. The story is not pacy at all. It takes time to grasp the surroundings and the happenings around the characters. The second half is full of confusions and surprises which will make your eyes pop out in amazement. The enchanting experience of Banaras is an added beauty to the whole novel. The downside of the book are spelling mistakes occurring at few places. The first half is pretty slow but it could have been spiced up a bit more. The book is a mix of love and culture and the rigid old system of 80's in India which made it tough for the people to express themselves. It's not a single person story. It's everyone's story be it John or Meetha or anybody else. It has elements of variety and a freshness in idea which makes it quite different from the others. It's worth going on a ride full of excitement, color, vigor and in the end a tale of love which will leave you with a lot to think about. Amazing review! I was waiting for a review from your side since a long time :) get well soon and keep up the good work.